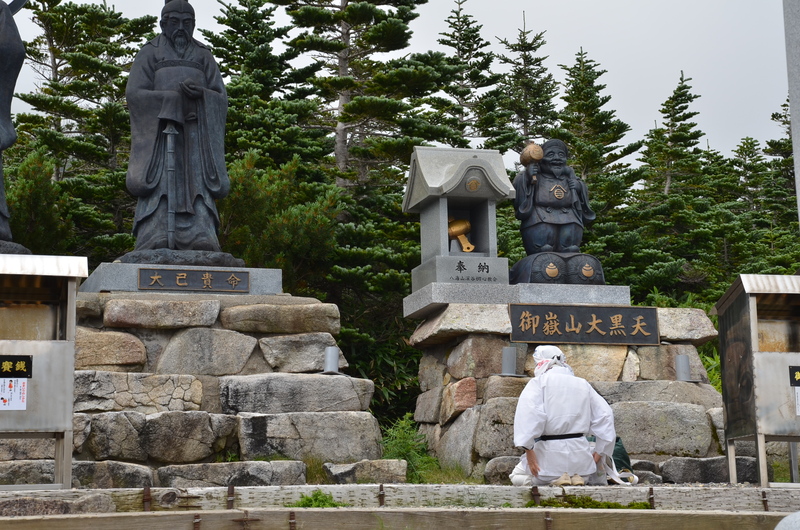 Spiritual practitioners have walked portions of the Ontake Pilgrimage Trail (also known as the Ontake Kodo (御嶽古道、lit. 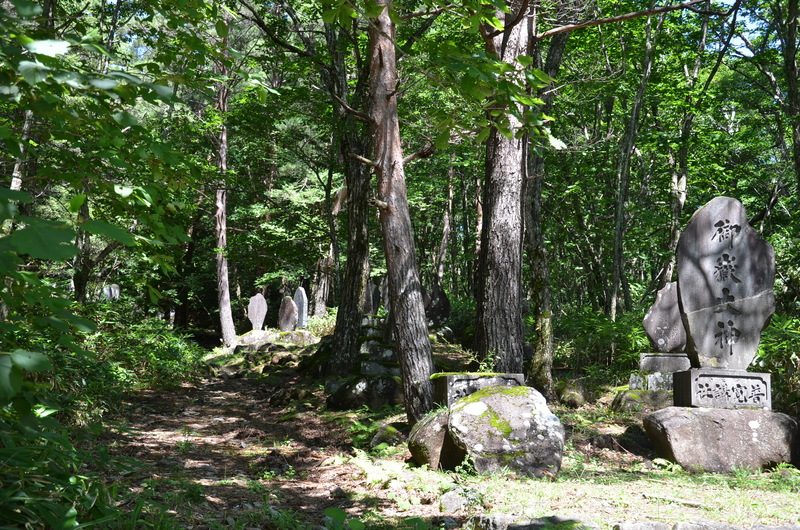 Ontake’s Old Road)) since at least the 9th century. 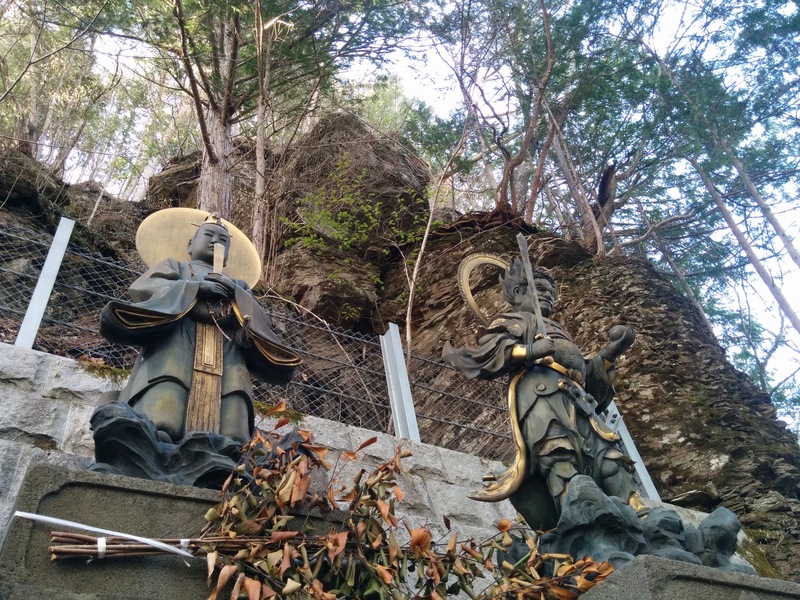 At that time Sangaku-shinko, or “mountain devotion” was practiced widely in Japan in conjunction with local Shinto and early Japanese Buddhism. Mountains were known as the meeting points of heaven and Earth, and certain peaks were considered particularly numinous. Mt. 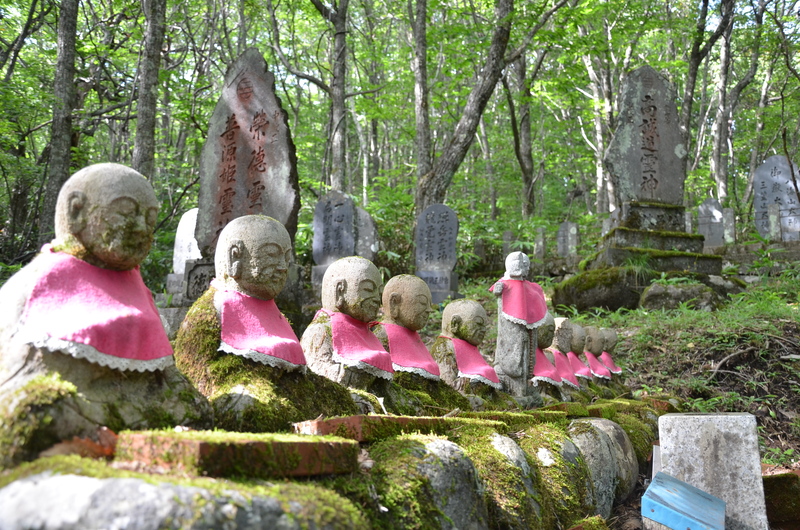 Ontake was among these, and pilgrimage on the mountain along with its rituals and purification practices was believed to bring enlightenment. 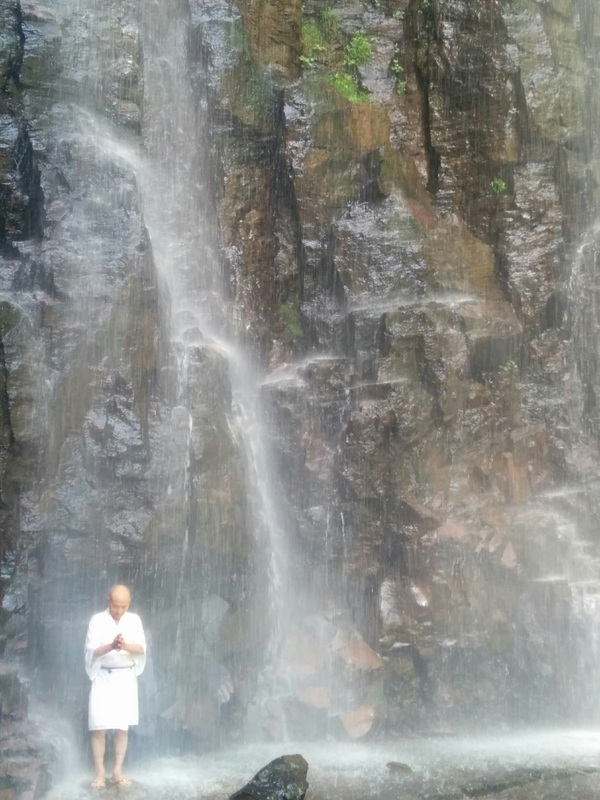 For hundreds of years practice on Mt. 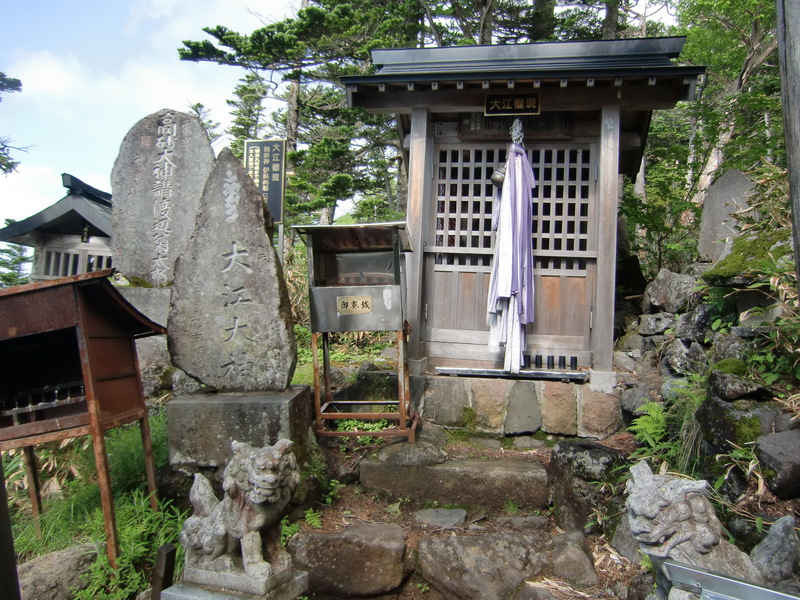 Ontake was restricted to ascetics and priests. 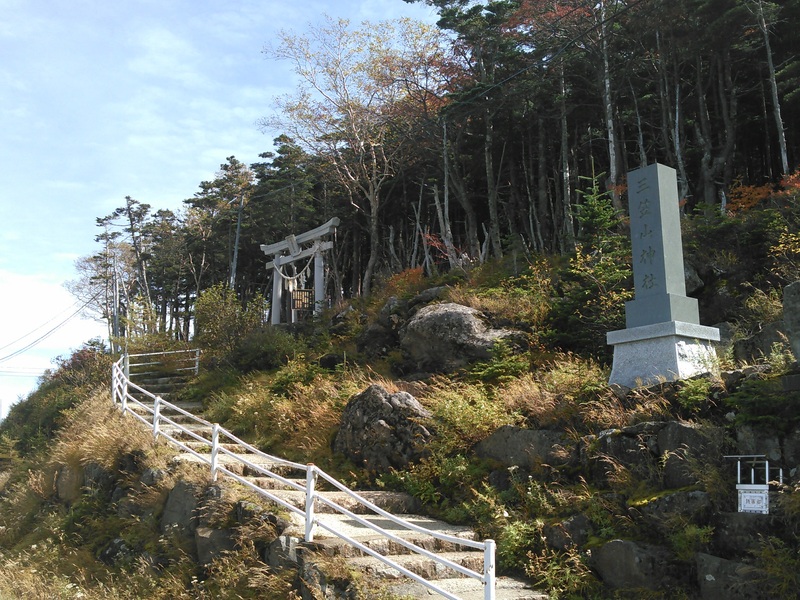 Then, in 1792, a priest called Fukan opened the trail from Otaki to ordinary people with the goal of making the mountain’s powers more widely available. 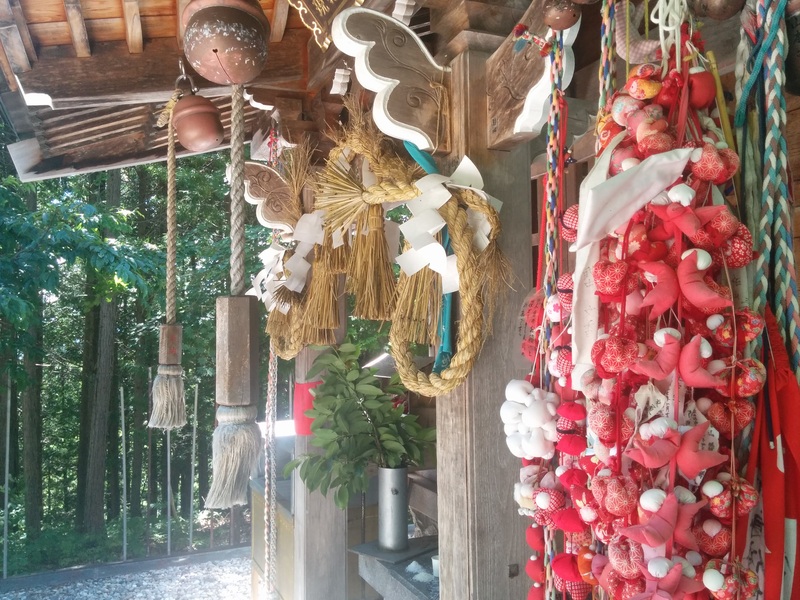 In the following decades its boons came to be associated with health, and faith in Mt. 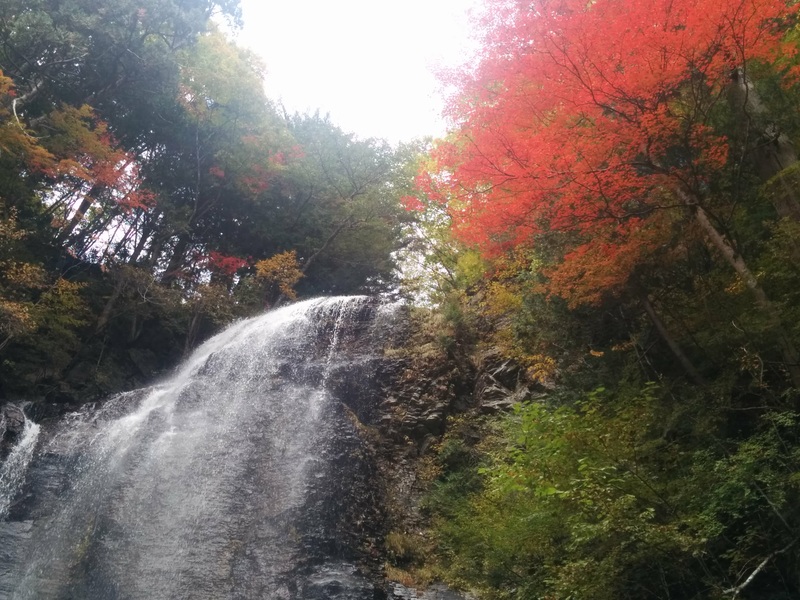 Ontake’s healing power spread throughout Japan. 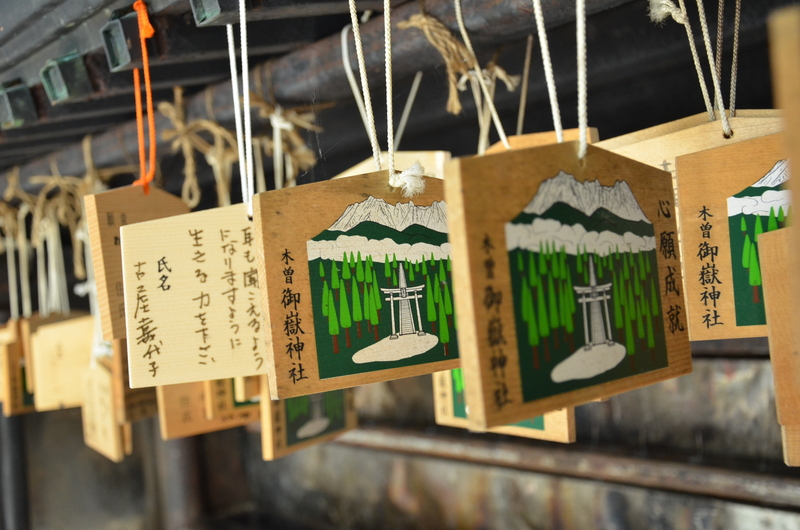 Today, believers still walk the Ontake Pilgrimage Trail to pray, purify themselves, and visit the many sacred places along the way. 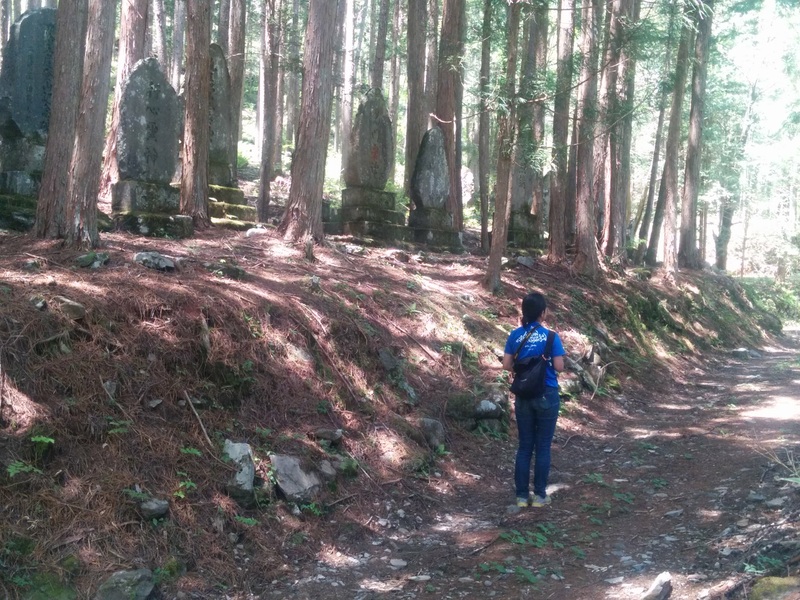 Much of the trail remains as it has been for centuries, winding through cypress forests, skirting cliffs of volcanic stone pocked with caves once used for meditation, crossing icy mountain streams. 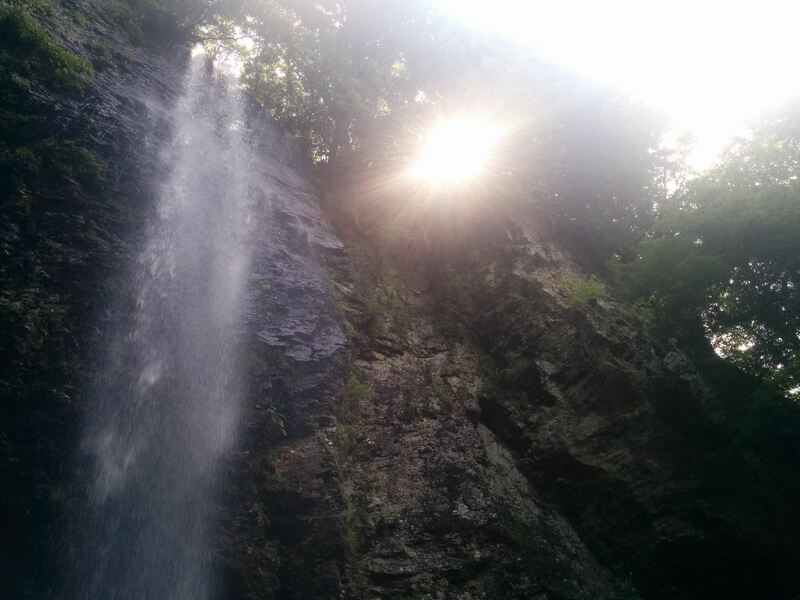 It runs past Kiyotaki Falls and Shintaki Falls, where pilgrims have undergone purification rites since ancient times. 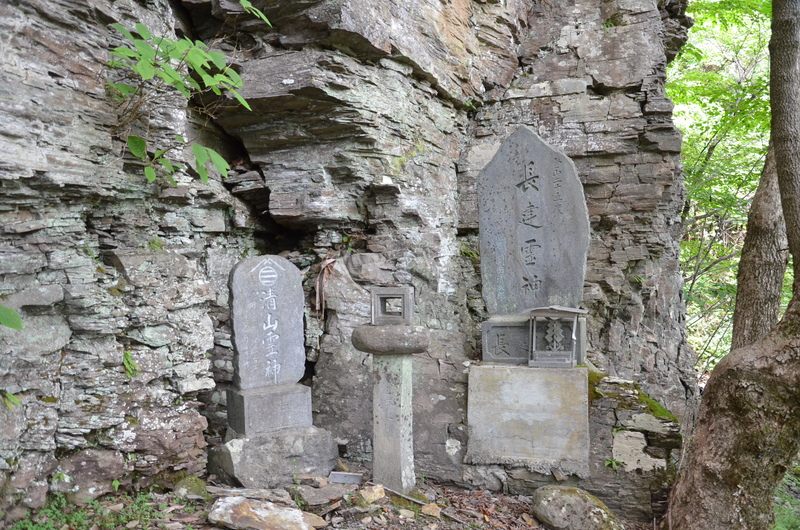 Groups of reijinhi, stone stella set as monuments to Mt. 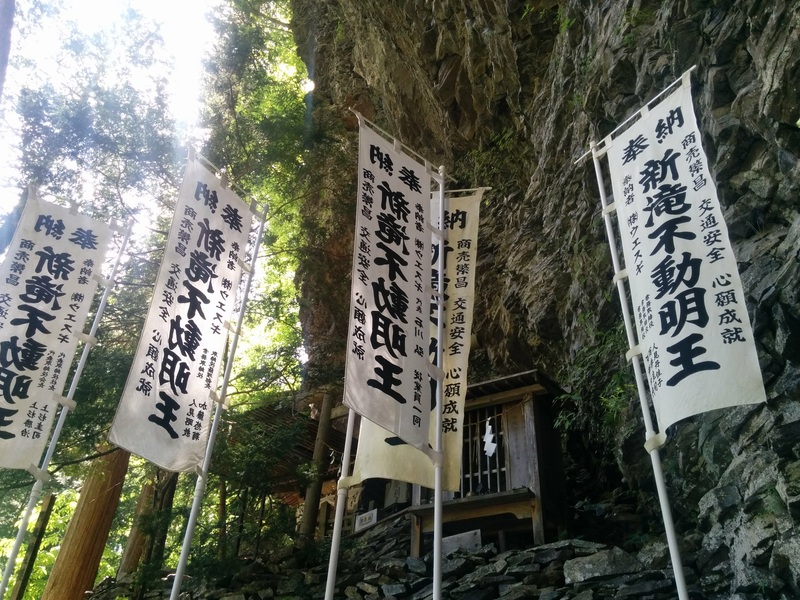 Ontake’s spiritual practitioners, line much the way, reminding visitors that this is no ordinary hiking trail. Certain areas along the way are known as a “power spots,” nexuses in the landscape believed to impart energy and healing to those who come. 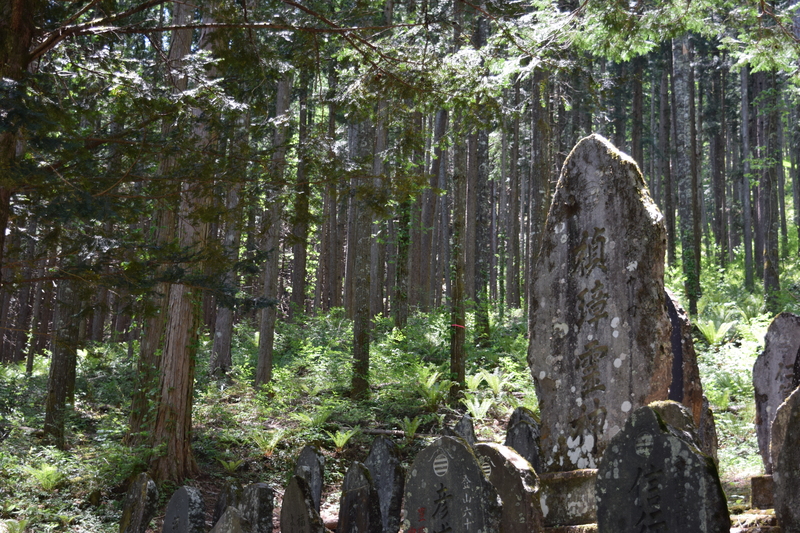 Indeed, the atmosphere along the Kodo is at different parts peaceful, mystical, otherworldly, and sublime. 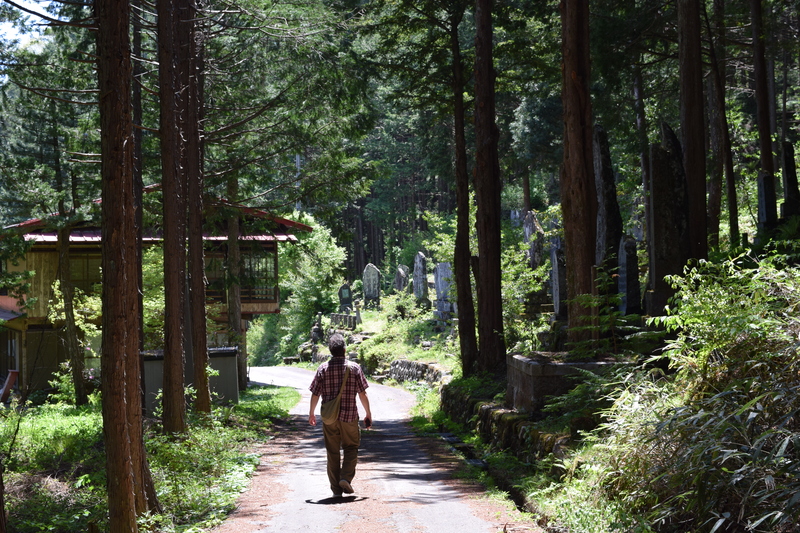 That said, like the Nakasendo, portions of it merge with paved roads. 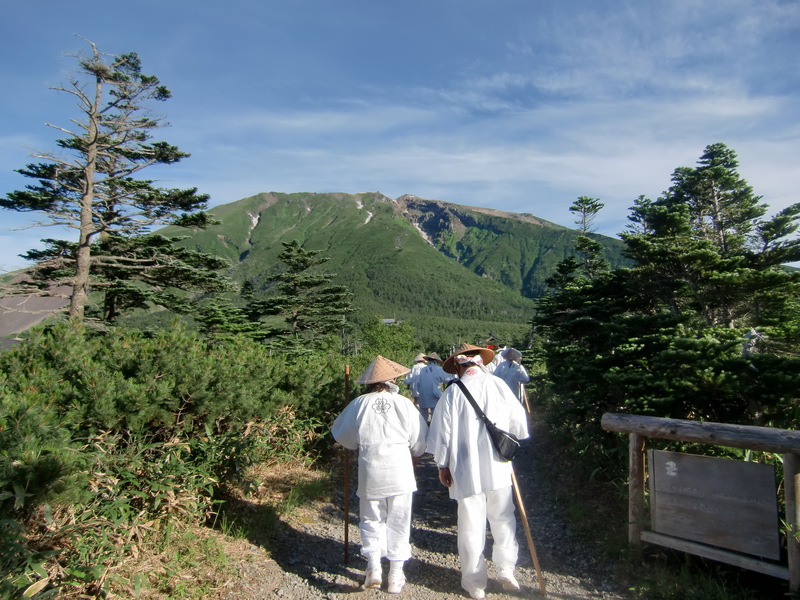 The Kodo starts in Otaki’s village center and historically ran nearly 15 kms to Mt. 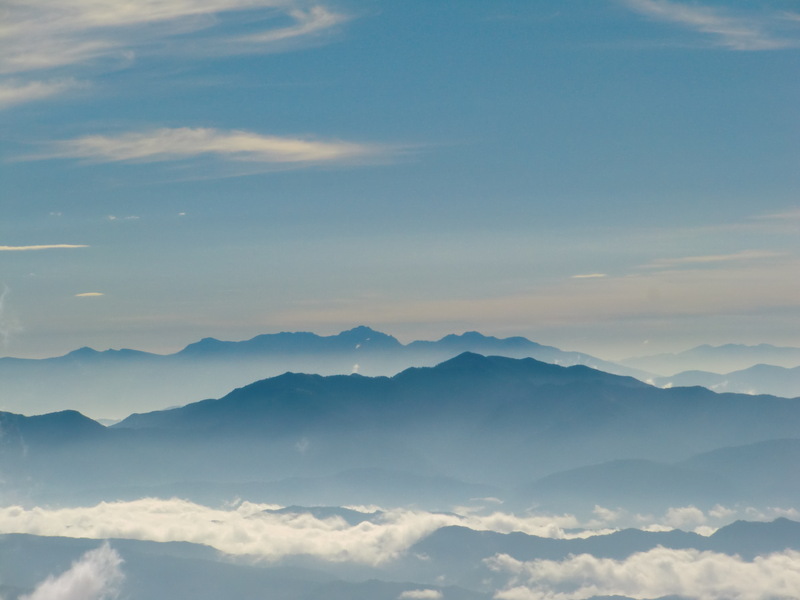 Ontake’s summit. 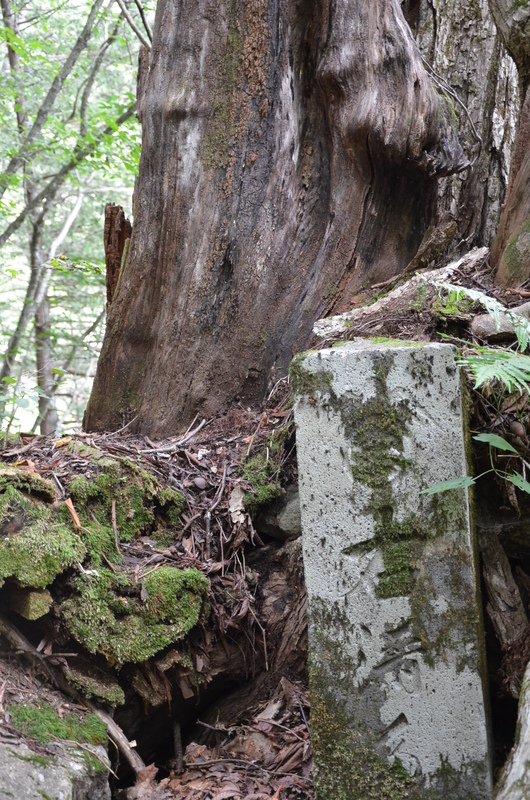 There were 10 gome (pronounce go-may), or stations marking the journey up the mountain. Today 9 of the stations remain (the 6th gave way to the ski field on the upper slopes of the mountain). 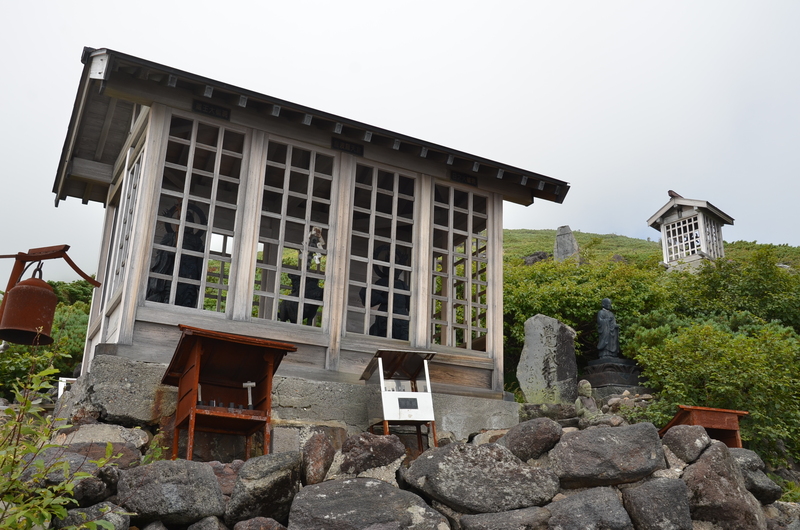 The 10th station is located at the shrine on the peak above Otaki; since Ontake-san’s eruption in September 2014, the summit has been off limits. Visitors can proceed as far as the 9th station. 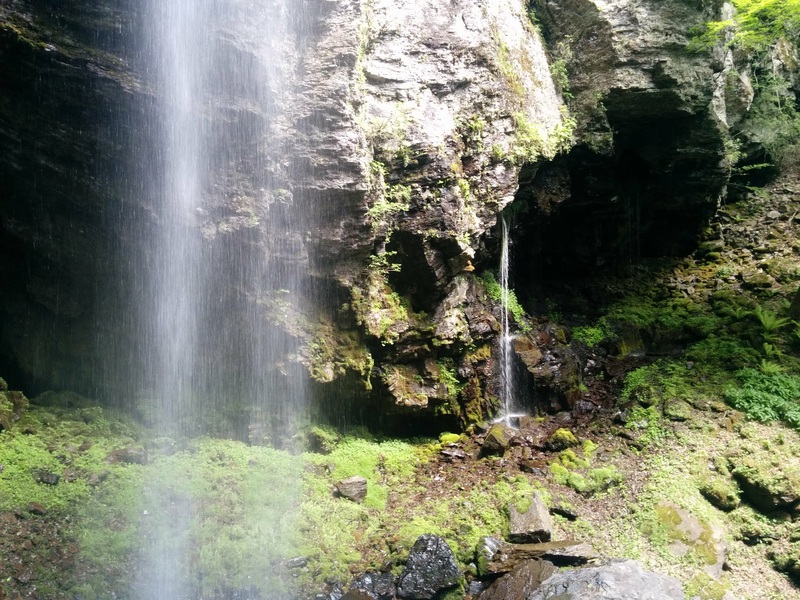 For most visitors, we recommend the Waterfall Trail (The green trail on the Google Map below). 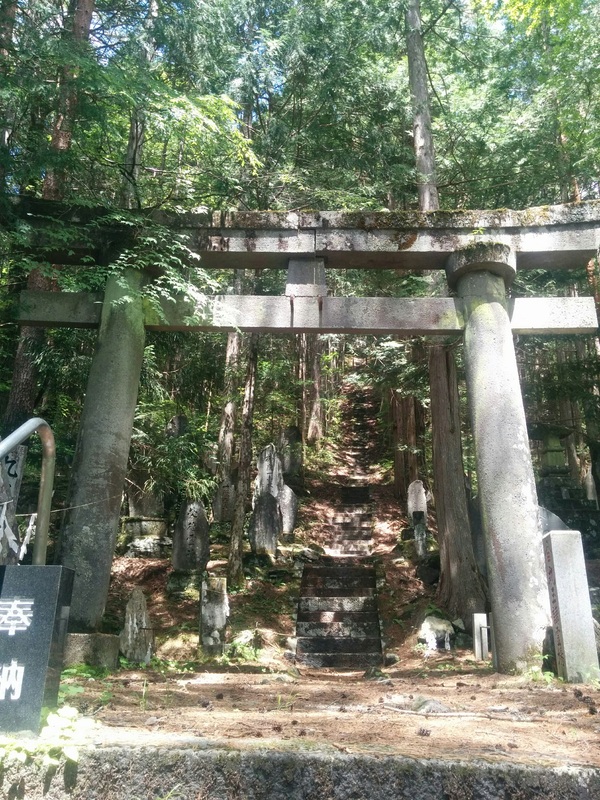 This loop takes about an hour and a half to walk and covers the Fourth stage of the Kodo, including some of its more otherworldly scenery. 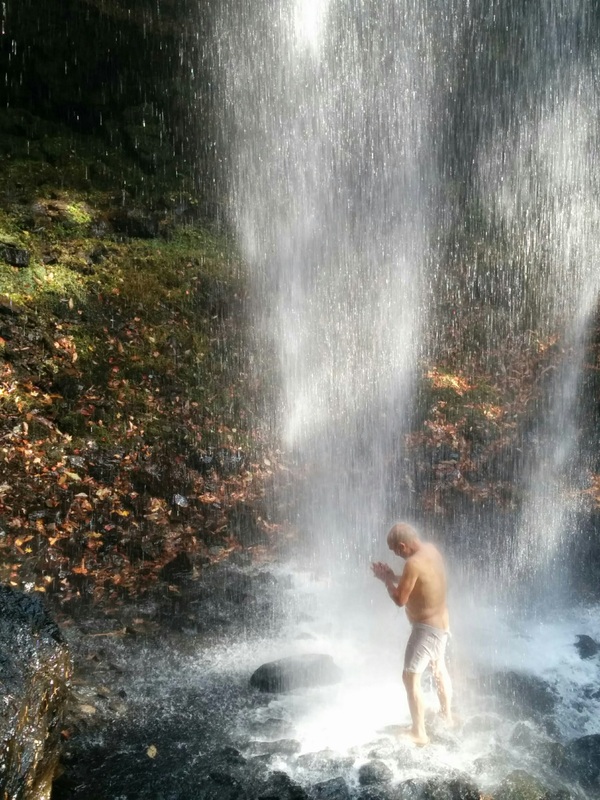 It also takes in Otaki’s most sacred and spectacular waterfalls. 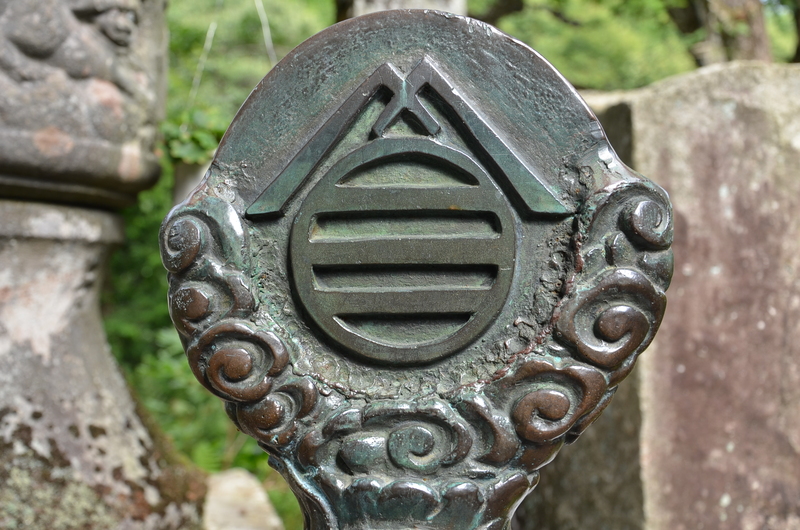 See the Ontake Pilgrimage Trail map below for detailed walking directions and times. And keep reading for info on and scenes of the various stages of the trail. 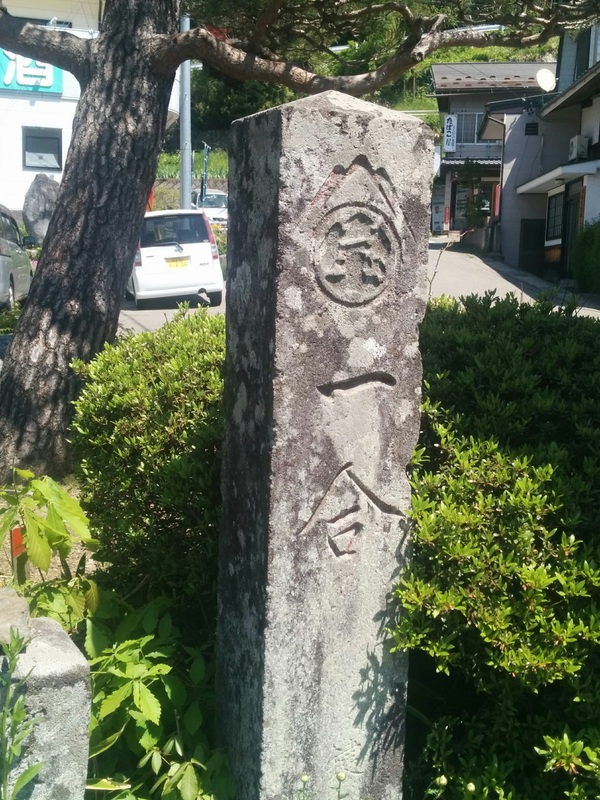 A stone post marking the start of the Kodo is located in front of the tourist info center. 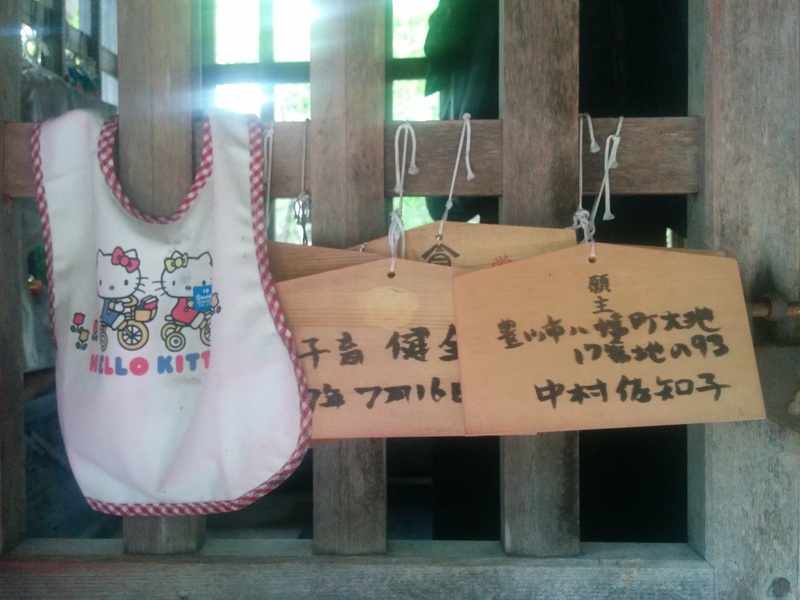 Ontake Satomiya Shrine is about a 1 km walk up the road. 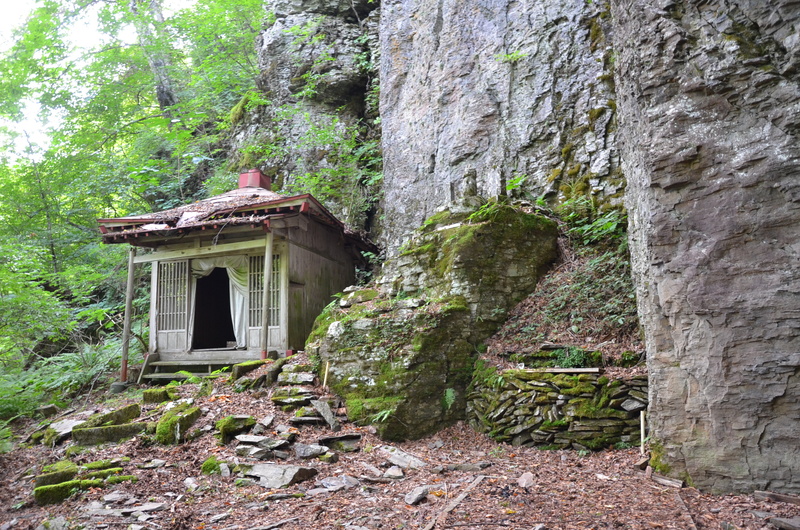 A visit there is essential to the start of any pilgrimage on the mountain. 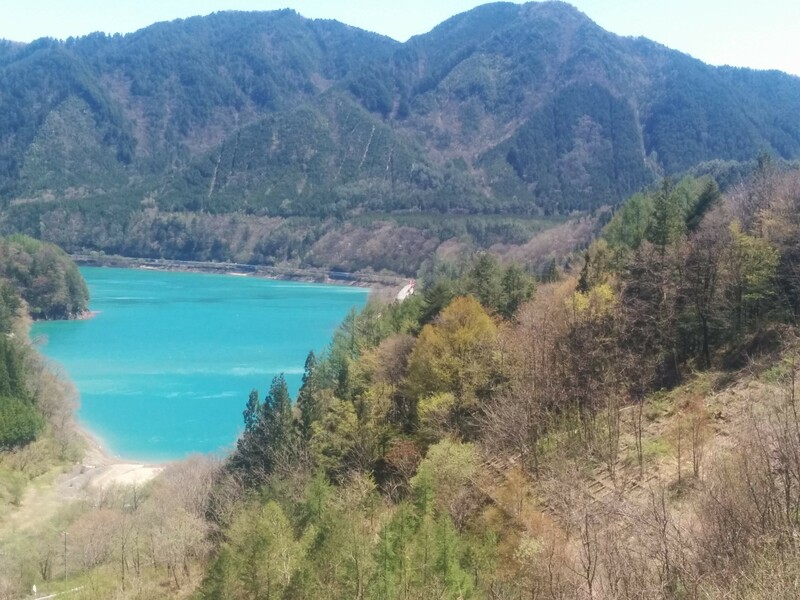 There’s a fantastic view of Lake Ontake along the way. Across the valley a concrete latticed swath stands as a reminder of when the mountainside collapsed during the 1984 Otaki Earthquake. 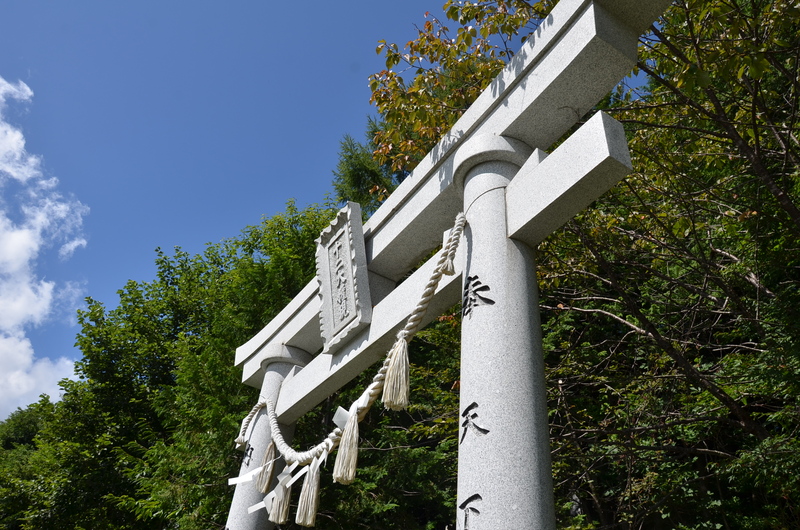 See the Satomiya Shrine page for more. 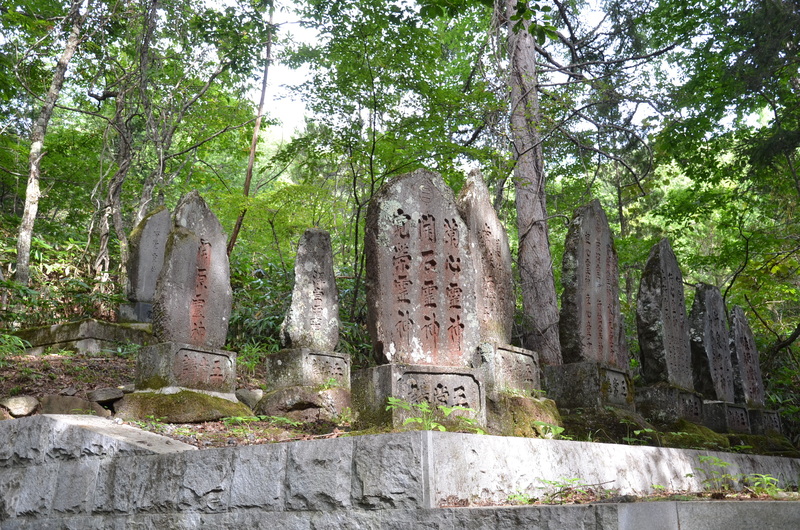 This kilometer walk along the roadway passes several complexes of reijinhi, stones commemorating mountain ascetics who trained on Ontake-san. 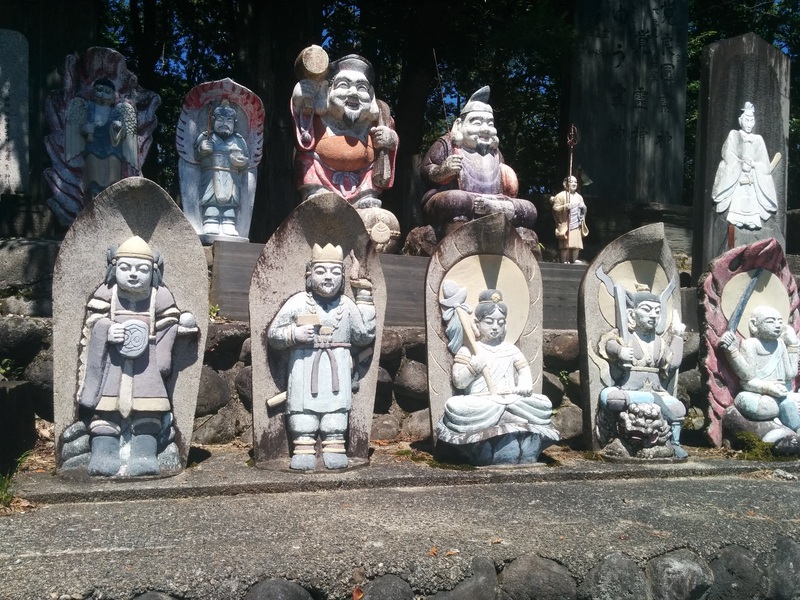 Important groups surround Fukan-do, across from Kurumizawa Ryokan, and Isshin-do across from Sakura Soba. 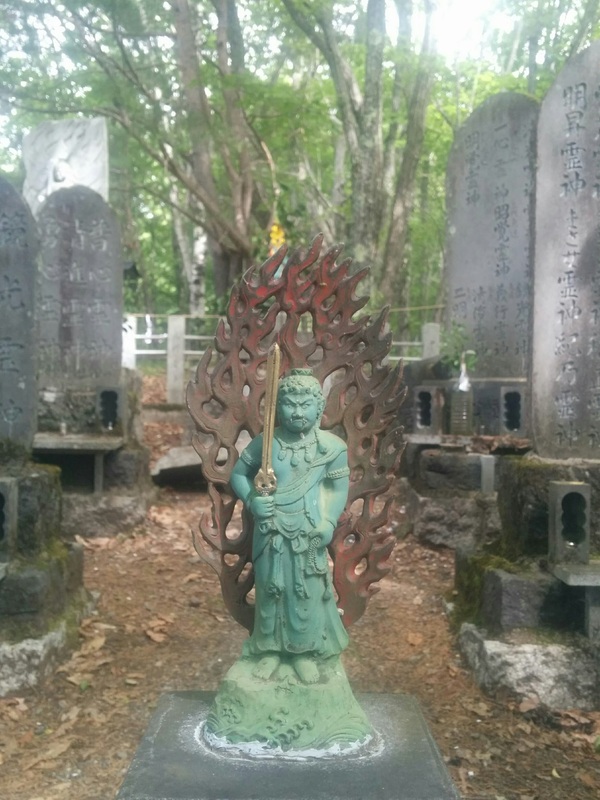 Fukan-do is dedicated to Fukan-gyoja, the founder of the pilgrimage trail from Otaki. 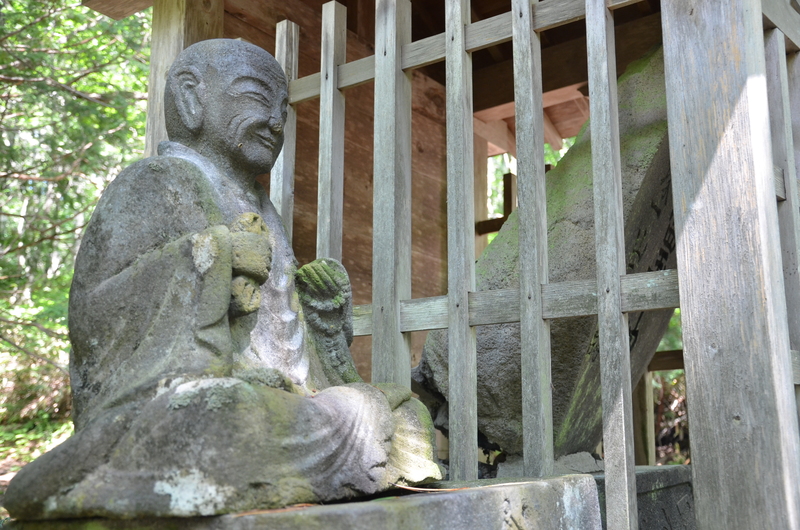 Isshin was his disciple and was responsible for the spread of the Ontake faith throughout 18th century Japan. 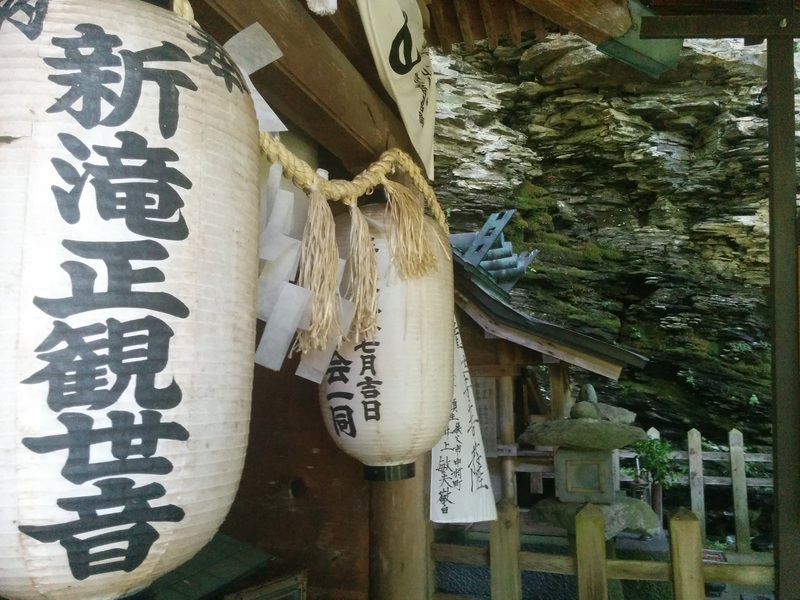 Sakura Soba is a great place to stop for lunch; Otaki’s pure water gives it some of the best soba in Kiso. 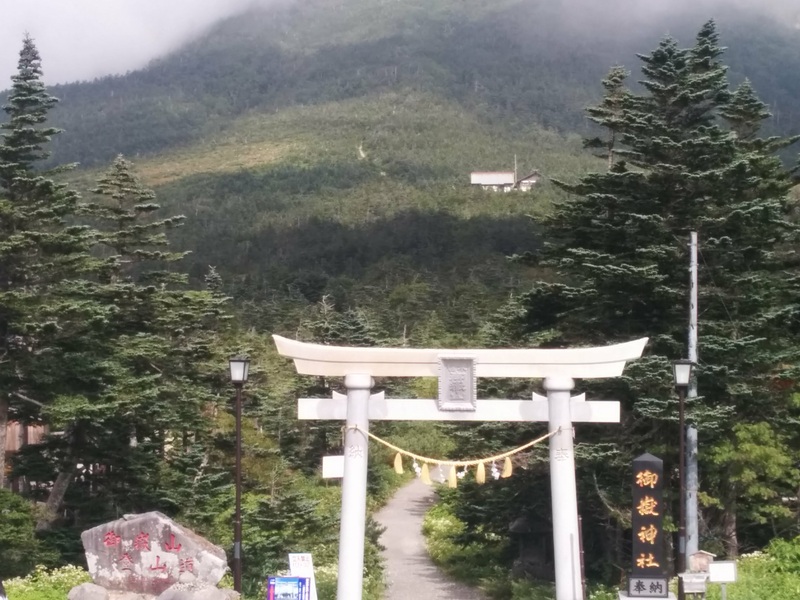 As you approach the turnoff for the second station, on clear days Ontake-san looms up ahead, providing the first view of the mountain on the route. 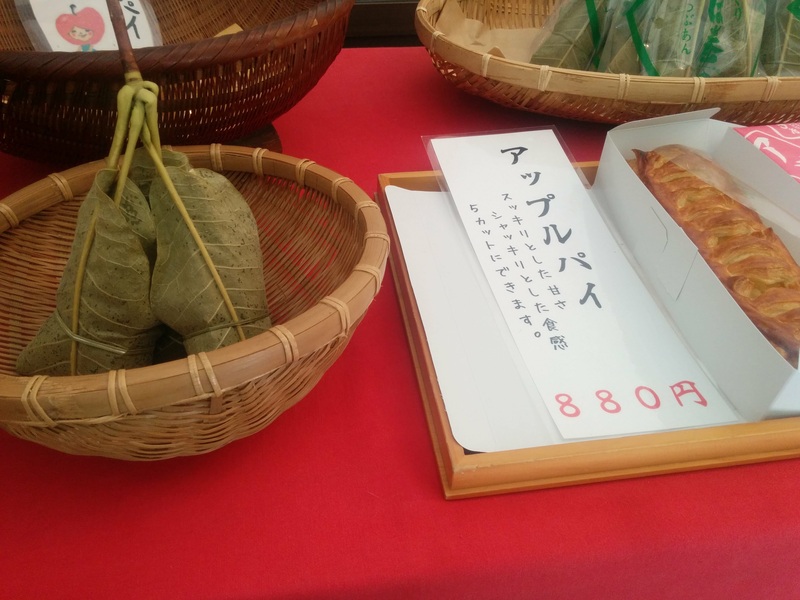 If you’re not ready for lunch, the Himeya bakery offers snacks like apple pie and local seasonal specialties like hobamaki. 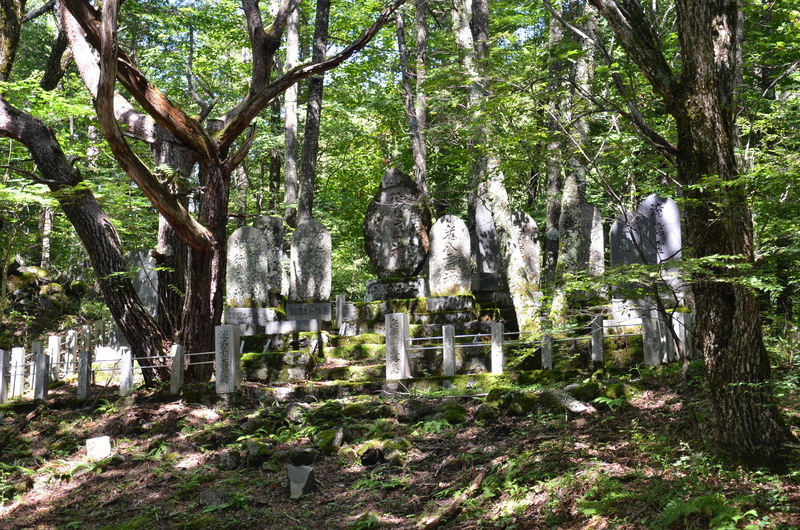 This pleasant section of the Kodo gets off the main road and meanders through pine and cypress forest and numerous stands of reijinhi. 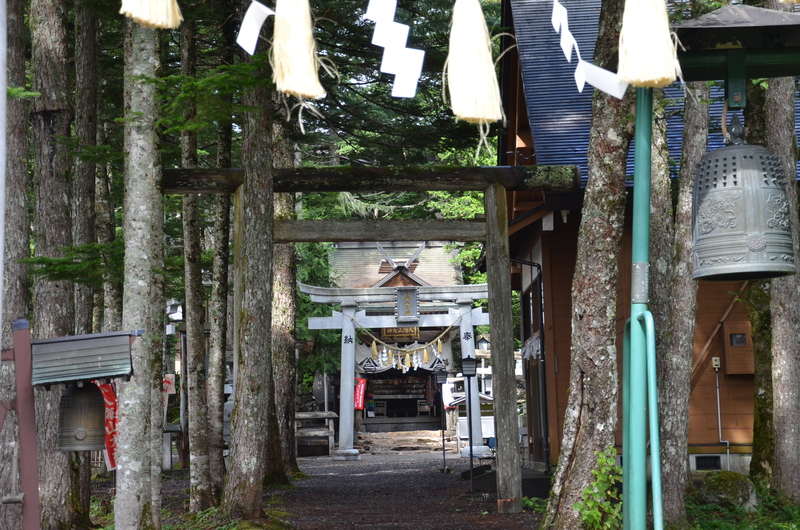 It rejoins the road for about 100 meters before arriving at the third station, the entrance to Omata Shrine. 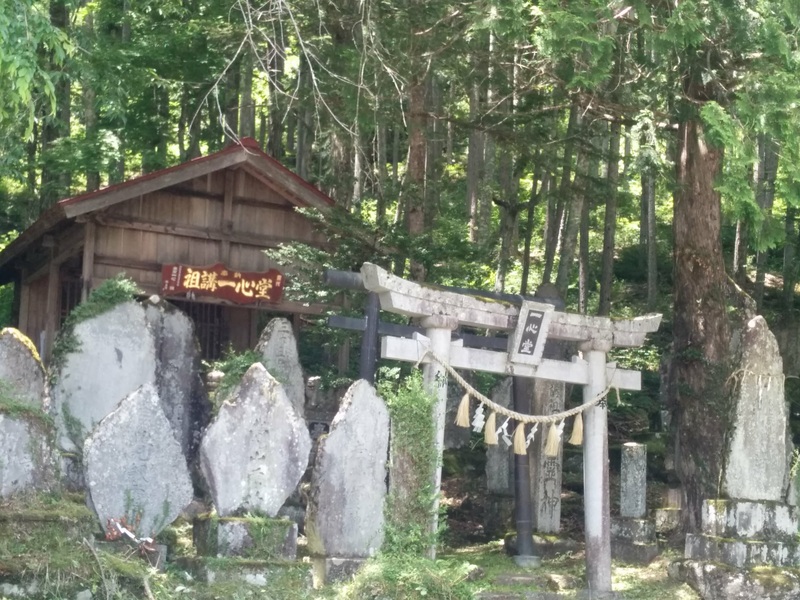 Just down from where the path rejoins the road, Mokusei-sha is a great spot to take a break and fuel up for Stage 4 with pizza, coffee, and more. 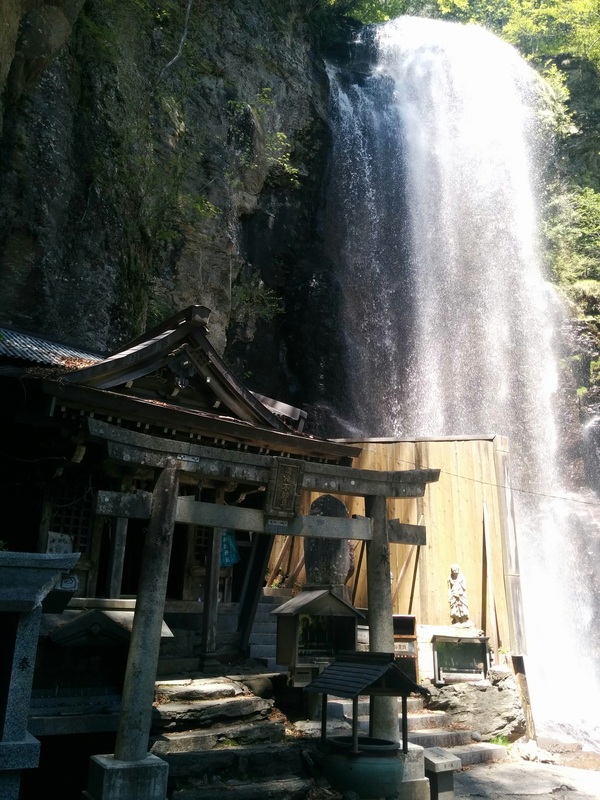 This stage is one of the most interesting and atmospheric portions of the whole Ontake Kodo. 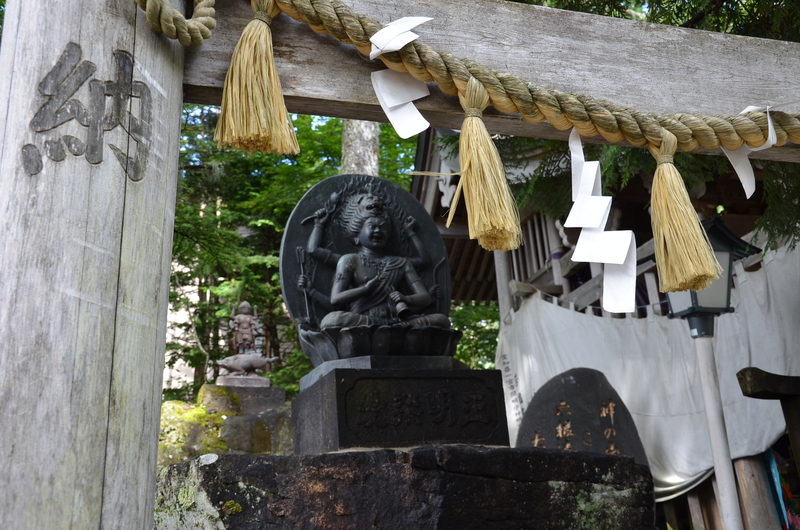 Stage 4 is the green trail on the accompanying Google Map, starting at the entrance to Omata Shrine. 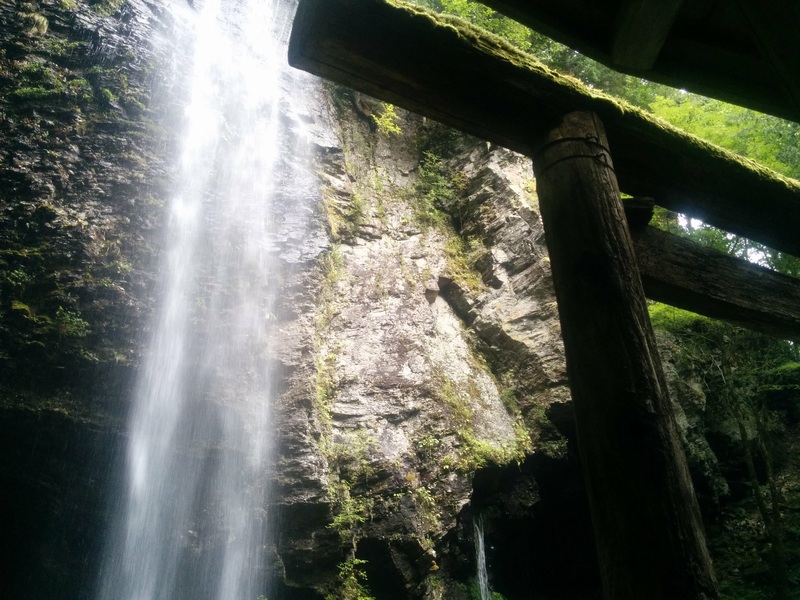 Stage 4 is also the first part of the Waterfall Trail; the second part circles back to the start via the famous purification sites of Shintaki Falls and Kiyotaki Falls. 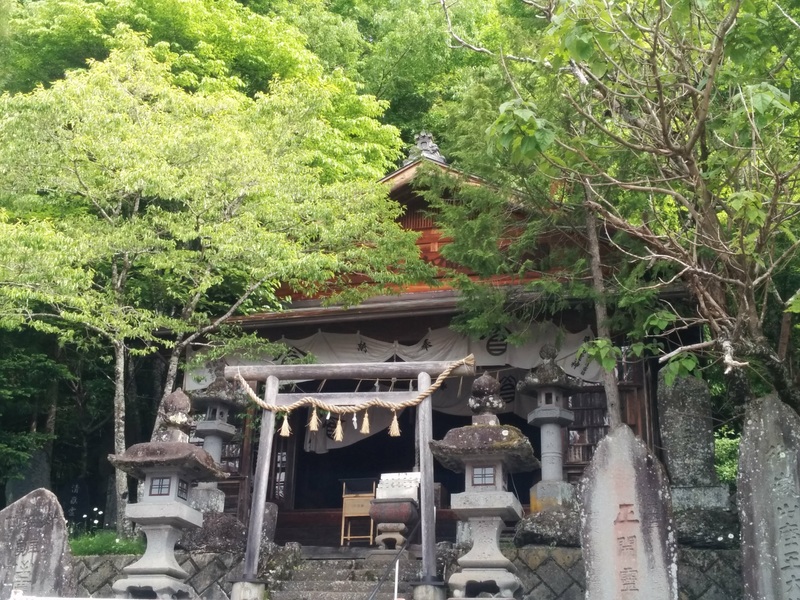 Isshin Shrine, dedicated to an early propagator of the Ontake Faith who used to meditate in the caves here. 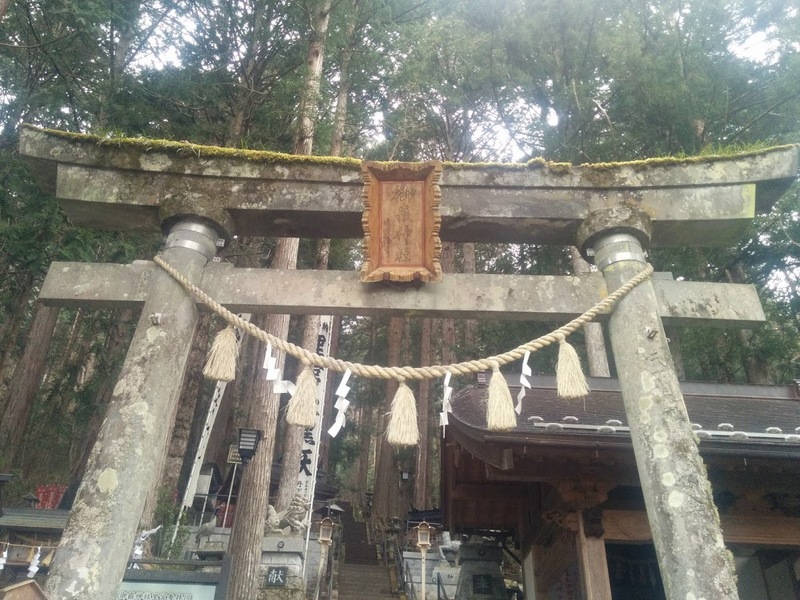 The first part of this walk follows the road before crossing a parking lot and plunging into the woods for a long climb up to Hakkai-san Shrine. This part of the trail is difficult to follow in places, and generally has less to offer visitors than Stage 4. 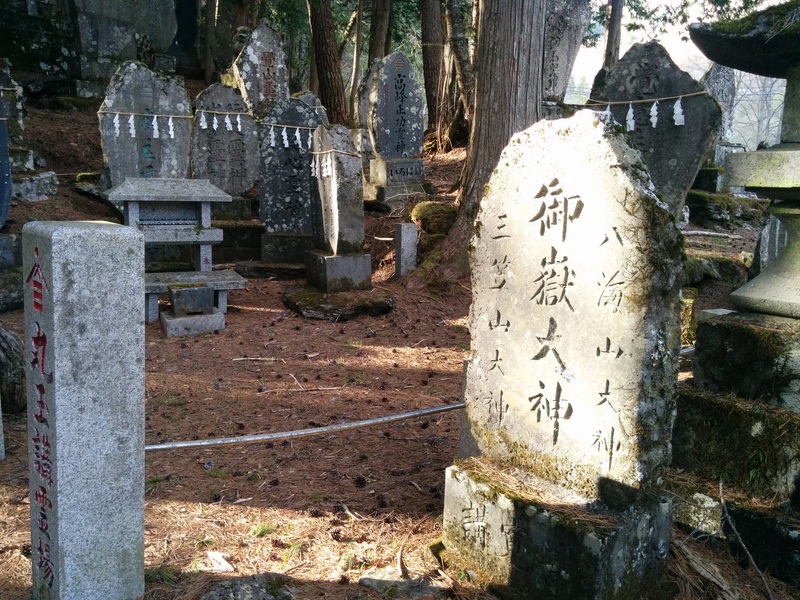 Still, if a long, atmospheric climb of a wooded trail lined with reijinhi is to your liking, you’d be following in the footsteps of 100s of years of the faithful. The Google Map offers only general guidance to this stage. 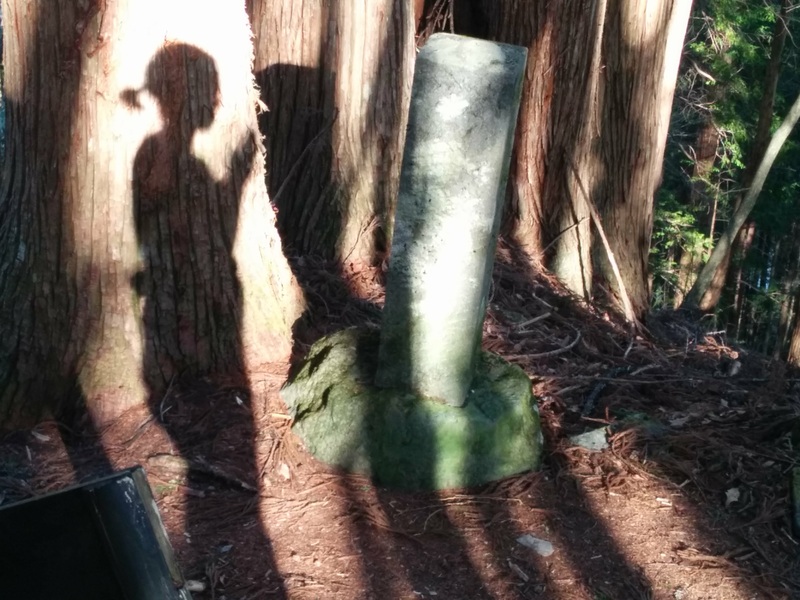 Contact us for more info if you want to hike this part of the Kodo. 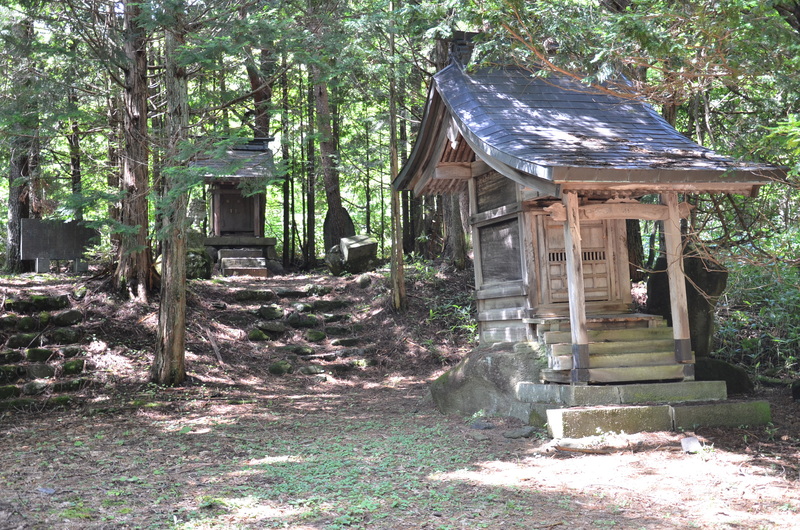 That said, if you’re driving to hike the Final Stage of the Kodo, it’s worth stopping at Hakkai-san Shrine along the way. This stage ushers pilgrims into Mt. 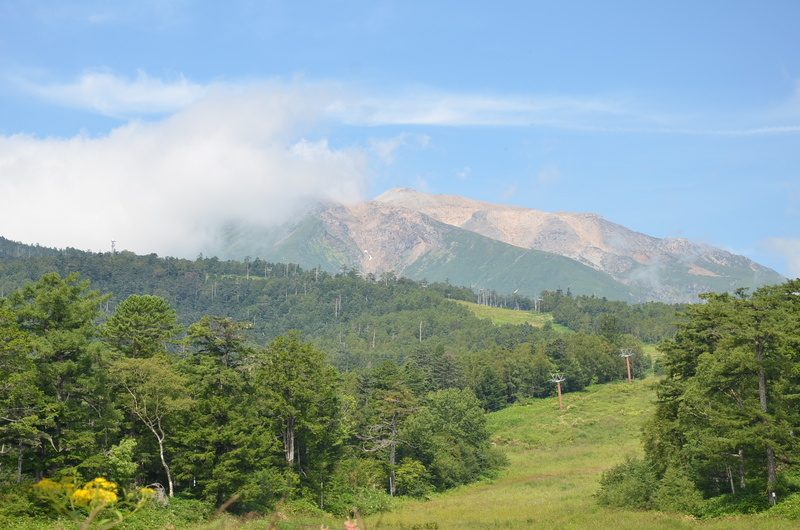 Ontake’s otherworldly volcanic alpine realm. 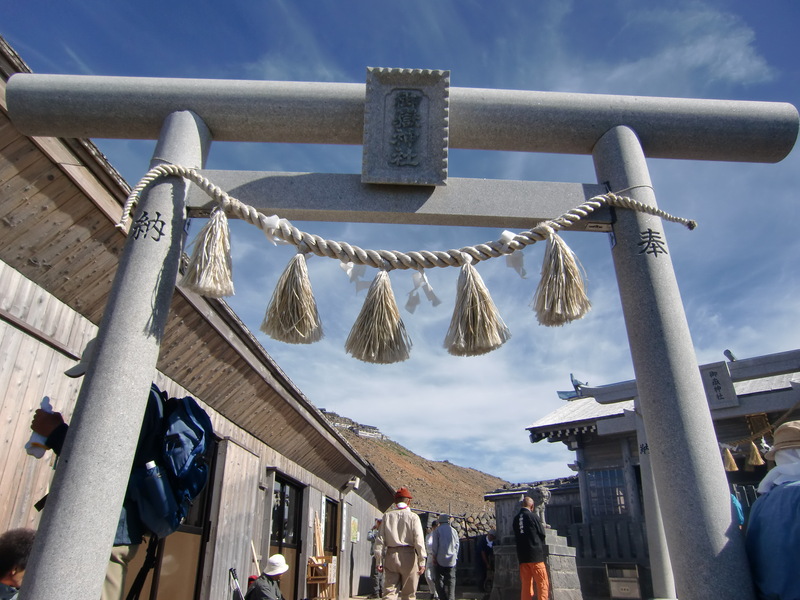 Traditionally the Kodo runs to the 10th station at Mt. 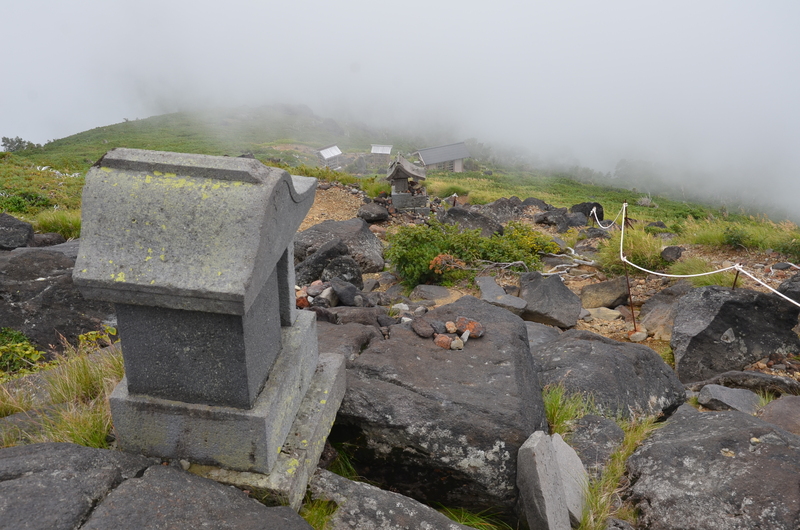 Ontake’s peak on the Otaki side of the mountain. 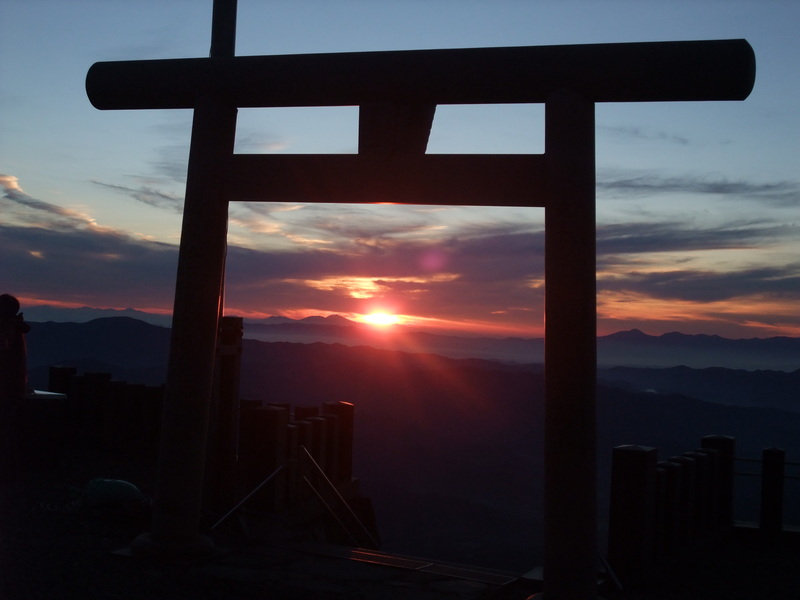 The 7th Station Mikasa-yama Shrine is dedicated to one of the three principle gods of the mountain.